Hey everyone! 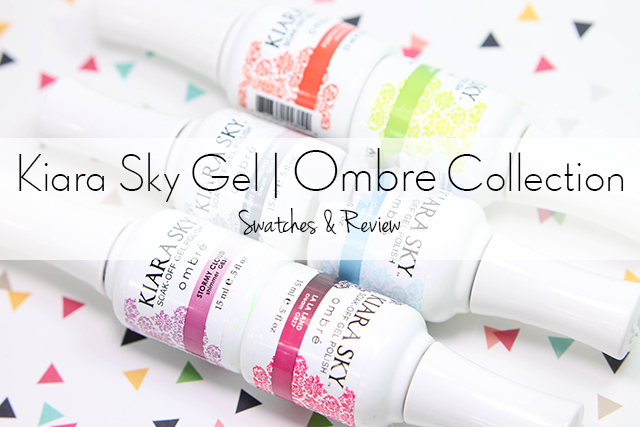 Part of my next post will be the gel polish edition on the same fabulous brand Kiara Sky. I recently reviewed their nail lacquers, this time I'm very excited to try out their gel polishes. The set of colors I received is part of their Ombre Collection. It's the fist time I've ever tried color changing polishes and probably the beginning of my new obsession. Knight & Shinning Armor- is a delicate dove grey which transitions to grey creme. The formula on this polish is perfection. I was impressed with how fully covered in one coat. Once applied it will change to dove grey and then transitions to bold grey once cold. This is one coat sealed with gel top coat. Stormy Clouds- is a lovely white which transitions to pale wisteria, with subtle of shimmers throughout the polish. 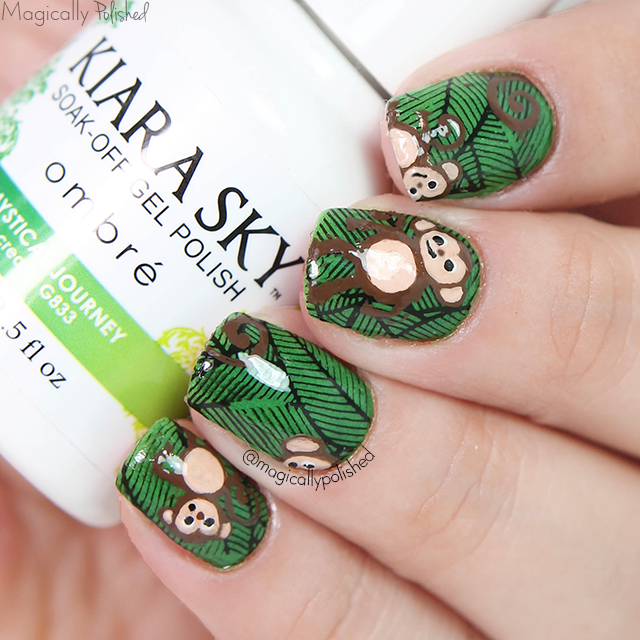 The formula on this polish is perfection and smooth application. Once applied it will change to white and then transitions to pink once cold. This is two coat sealed with gel top coat. 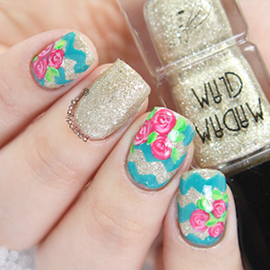 For this look I really wanted to add a stamping design, which will look really cool when it was transitioning. I simple added a heart bound stamping plate from Bundle Monster, using Noir Black. Lastly I sealed the design with gel top coat. La La Land- is a fun and florescent pink which transitions to brown. The formula on this polish is perfection. I was surprised how opaque it was in one coat! Once applied it will change to florescent pink and then transitions to brown once cold. The formula was not to thick or thin and was easy to apply. This is one coat sealed with gel top coat. Pumpkin Carriage- is a lovely salmon pink which transitions to orange, with subtle of shimmers throughout the polish. The formula on this polish is perfection and applied smoothly. Once applied it will change to salmon pink and then transitions to orange once cold. This is two coat sealed with gel top coat. Mystical Journey- is a gorgeous light green creme which will transition to dark green. The formula was just perfect and applied perfectly on the nails. Once applied it will change to light green and then transitions to a dark green once cold. This is two coat sealed with gel top coat. 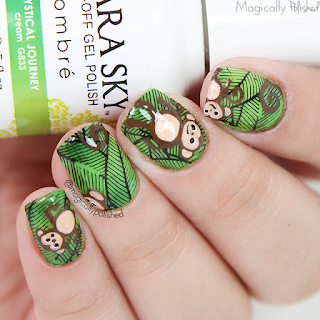 The first thing that came to mind after trying out this polishes was a jungle theme. The color was the perfect to use for the leaf pattern from hehe028 stamping plate from Wiino Shop. 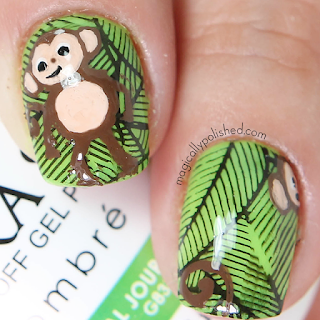 Once that was set, I then freehand the monkeys using brown and light brown acrylic paint. Lastly I then sealed the design using gel top coat. Oh Romeo- is a glittery light blue which transitions to a dark blue, with subtle of shimmers throughout the polish. The formula on this polish is perfection and applied smoothly. Once applied it will change to light blue and then transitions to dark blue once cold. This is two coat sealed with gel top coat. 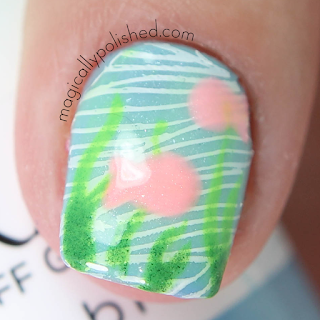 Now that it's summer, I thought Oh Romeo was the perfect shade for an underwater theme. 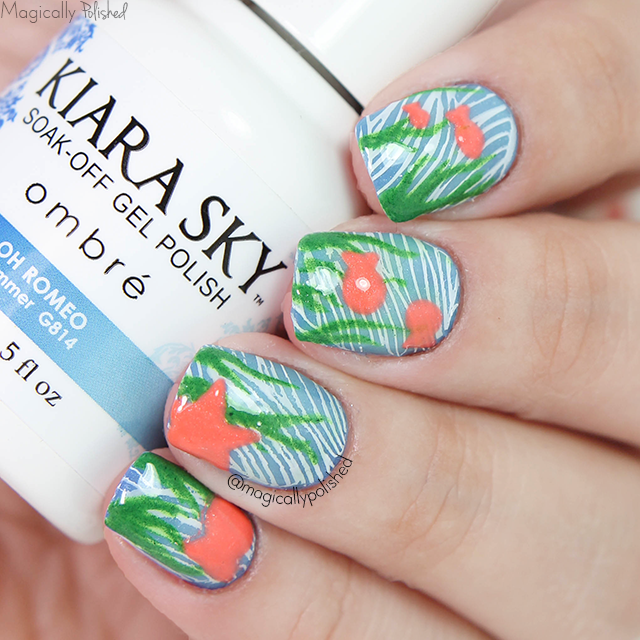 I first added a stamping design using hehe026 with white stamping polish. Once that was set I then freehand some seaweed using Mystical Journey and a few fishes using Pumpkin Carriage. Lastly I then sealed the design using gel top coat. Love how it looks when it transition.